We have the expertise, crew, resources, and experience to design a stellar water garden that can add tranquility to your space. What’s more, we can create water gardens which look indistinguishable from those found in nature. Ecosystem pond construction is no easy feat to accomplish because it’s extremely important to know how to set up a balanced ecosystem so that Mother Nature can work her magic to provide food, shelter, and safety to the aquatic life that’s in the pond. With our experience and expertise, you will be amazed by the types of healthy ecosystems we can create. 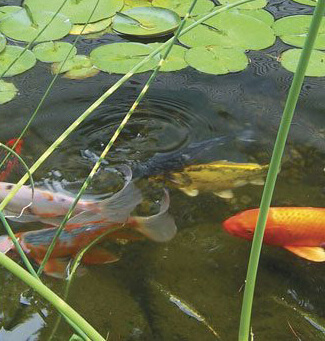 Building a dedicated koi pond requires an extensive knowledge of koi fish as well as the environmental elements that will be most favorable to their survival and well-being. We will combine both our knowledge and our years of experience to construct a uniquely sophisticated koi pond for you. Constructing swimming ponds & natural pools takes tremendous experience, expertise, and creativity. At Fitz’s Fish Ponds, we use a combination of fine filters and hydraulic construction techniques to design amazing NSPs for you. A natural, fishing and large pond is a manmade body of water which is enclosed by a membrane. Such ponds which have robust ecosystems will attract a variety of animals from the surrounding environment, including birds, frogs, insects, salamanders, butterflies, and turtles. You can also expect fishing opportunities from this type of ponds. Formal ponds can enhance the look of your garden, land or property in a dramatic way. They are beneficial to the environment, and are much more classy and sophisticated than traditional swimming ponds. Let us build you a fabulous formal pond today! When it comes to building or maintaining above ground pools, it takes considerable knowledge and expertise to get the job done perfectly. Designing and maintaining an elegant above ground pond is no easy task, but you can trust us to rise up to the occasion.